1. Preheat the oven to 200°C, gas mark 6. Cook the pork according to pack instructions for 30-35 minutes. 2. Meanwhile, cook the green vegetables in a pan of boiling water for 3-4 minutes until tender, then drain well. 3. In the meantime, cook the mash according to pack instructions. Stir the vegetables into the mash to make champ. Spoon onto plates and serve with the pork. Packs of prepared mixed vegetables offer an easy way to get a variety of veg into one meal. 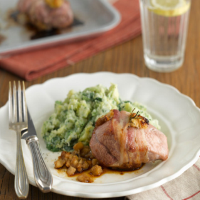 Try the Waitrose speciality kale selection, which works well with pork and fish dishes.